Insurance comes in a number of different forms and serves a variety of purposes, but one of the more common reasons someone pays for insurance coverage is to shield themselves from absorbing the costs associated with property damage and/or an injury. Thus, when coverage disputes arise, policyholders often feel trapped because they cannot afford to pay all the incoming bills, but may also struggle to pay for contesting a denial of the claim. People are most likely to encounter coverage disputes related to issues like auto accidents, home property damage, and catastrophic medical conditions. But, regardless of whether the insurance is required by law (auto insurance), or voluntary, (life insurance), all policyholders purchase with the expectation that the insurance company will pay out claims when a covered incident occurs, and assume if a disagreement does occur they can file a lawsuit to resolve it. However, a large number of insurance companies now require any dispute with a policyholder to be worked out through arbitration, not litigation. Arbitration presents many disadvantages to policyholders when compared to traditional litigation, and the clauses that mandate this alternative resolution choice are almost always buried in small print so purchasers are very unlikely to see them. The federal government realizes the unfairness of these clauses, and recently issued a report that provides a review of the insurance industry. The insurance industry is, by and large, regulated by the states, and as a result, any policies released by the federal government are not enforceable, and essentially serve as suggestions or recommendations. On the issue of mandatory arbitration clauses in consumer insurance contracts, the federal government is urging states to curb an insurance provider’s ability to impose these clauses on buyers. Further, the federal government is asking state legislators to assess whether the lack of uniformity on the regulation of arbitration clauses in the insurance industry adequately protects consumers as compared to protections extended to consumers in other financial products and services. Florida does not have a statute on the use of mandatory arbitration clauses, and while some courts have restricted their use in certain industries, companies are mainly allowed to force them onto customers at will. However, the Florida Division of Consumer Services does offer a modicum of regulation through informal mediation services offered to resolve insurance coverage disputes in auto accidents, home property damage, and sinkhole claims. These services are available upon request before a lawsuit is filed, and non-binding. The mediator is chosen by the Division, which is intended to remove any bias the mediator may have toward a particular party, but still offer the consumer the option of litigation if the mediation does not work out. 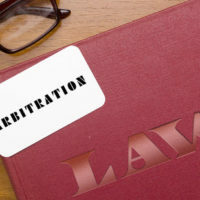 Companies usually decide to include arbitration clauses to block customers from filing class action lawsuits that could cost millions of dollars to defend and settle. In addition, the companies usually reserve the right to pick the arbitration body that will decide a dispute, which allows them to select organizations that tend to favor businesses. These motivations result in the consumer being forced to participate in private proceedings that often restrict the amount of evidence a party can present compared to the types of evidence permitted in court. In addition, the right to appeal a decision is limited, and the awards issued by arbitration are typically much lower than awards from a jury. Further, because these proceedings are private, the public never learns of potentially harmful practices pervading a company or industry, and consequently, the companies do not feel pressure to change as a result. If you have an insurance dispute, do not tackle this unfair fight alone. Consult an lawyer experienced with insurance coverage disputes to help level the playing field. The Miami law firm of Pita Weber Del Prado will fight for the coverage benefits you paid to receive. Contact the office for a free consultation.